Acoustical Imagery: See Your Noise Problem! Locating the source of noise and propagation pathways of noise are an important part of the acoustical diagnosis. To correctly answer this question, acousticians use different techniques to visualize noise problems and quickly find the best solution. This step in the diagnosis is essential to focus on the right part of the problem. Acoustical imagery helps to invest time and capital on the elements that will quickly bring the reduction of noise. Call on our expertise in acoustics for all your noise problems. Different methods, used or developed by Soft dB, will help you find and identify your noise problems. The beamforming technique generates a sound video from the signal processing of an array of microphones. Sound videos are obtained by computing the phase shift of incoming sound waves that are received differently at each of the microphones according to their angle and position in comparison to the other microphones. 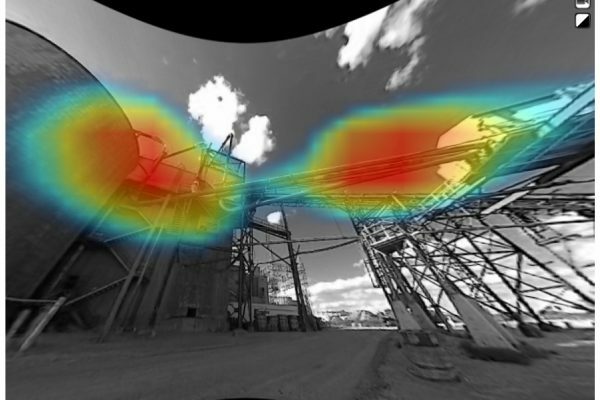 This technique is useful to quickly identify noise sources, even if they are in motion. Beamforming is an essential solution in the analysis of large plants, where a lot of equipment functions simultaneously. One major problem in acoustics is the identification of noise leaks or hot spots of radiated sound. 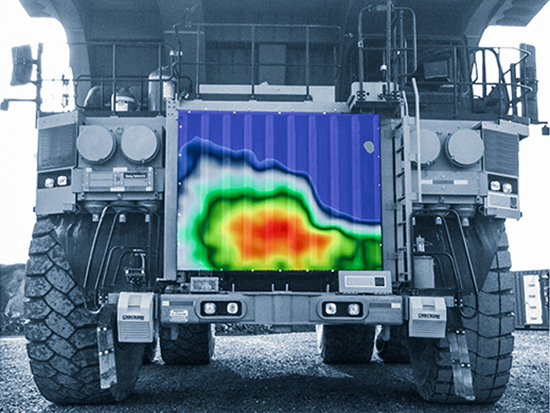 Soft dB has developed an advanced sound imagery technique based on the combination of the sound intensity sweeping method and spatial positioning systems. This results in a technique that dramatically increases the precision of the sound map and the identification of noise issues. This type of diagnosis allows the acoustical treatment to be focused at the right place in order to get the most out of your sound reduction projects. 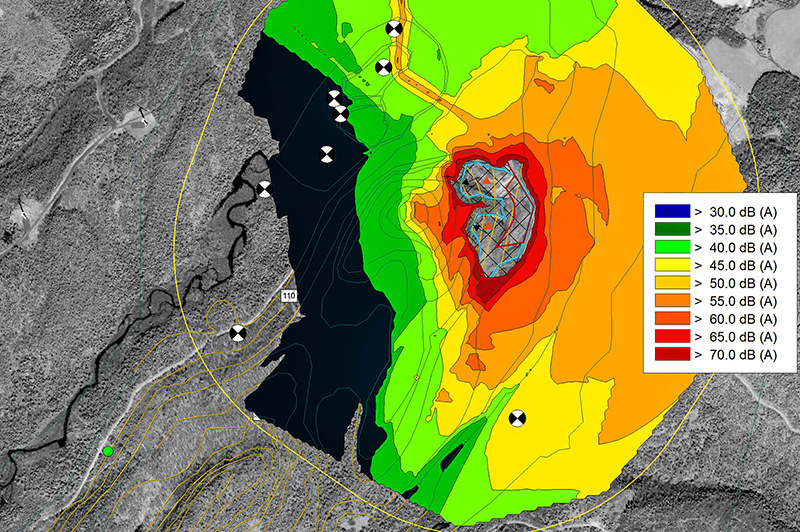 We offer cartography services to map noise from industrial sites. We use many well-known software programs such as Cadna-A and Soundplan. 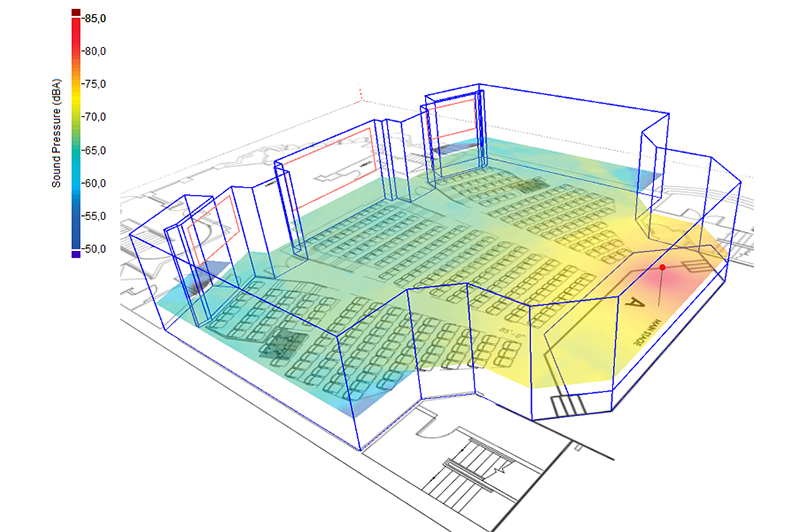 These acoustical maps are very useful for comparing the acoustical impact of different operation scenarios and to visualize the effect of acoustical treatment. The secret behind our powerful modulating tool resides in the people that measure, calibrate and model the industrial sites. With the rigorous approach proposed by Soft dB, we can attain a high level of confidence in the results obtained by the modelling of the site. Interior plant cartography differs from environmental modelling by the way confinement affects sound propagation. Sound pressure levels quickly rise out of the human ear’s comfort zone and these effects can find themselves concentrated in certain areas of the room, depending on its geometry. With interior cartography, it is possible to determine where acoustical energy accumulates, which dictates in which work zones the acoustical treatment should be applied. In confined spaces, sound waves can behave differently than in open spaces. This behaviour can be counter-intuitive and modeling tools, coupled with on-site measurements, can help identify problems. With the help of the RAP-ONE-II acoustical prediction software, developed in house by Soft dB, it is possible to visualize most of these problems with sound maps that show the spatial distribution of acoustical energy. 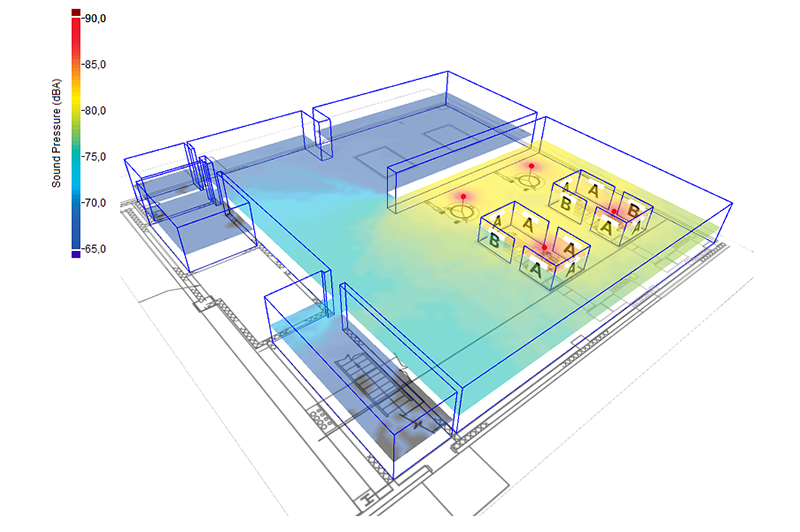 These simulations help show the effect of acoustical treatment in architectural projects. Industrial blowers, alternators, air-conditioning or exhaust systems all emit noise that can be irritating. The main source of noise is often the turbulent flow producing acoustic waves, known as aeroacoustics. Aeroacoustics noise is a complex multidisciplinary science involving airborne and structure borne acoustics, aerodynamics and structure vibration and deformation. 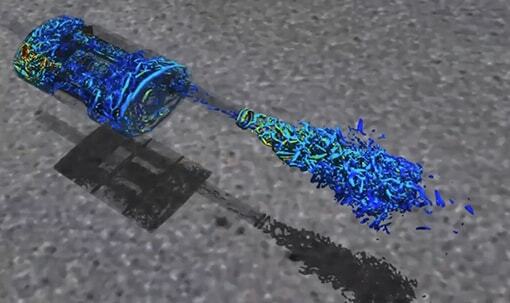 Computational Fluid Dynamic (CFD) imagery can help identify the course of action to help noise mitigation. 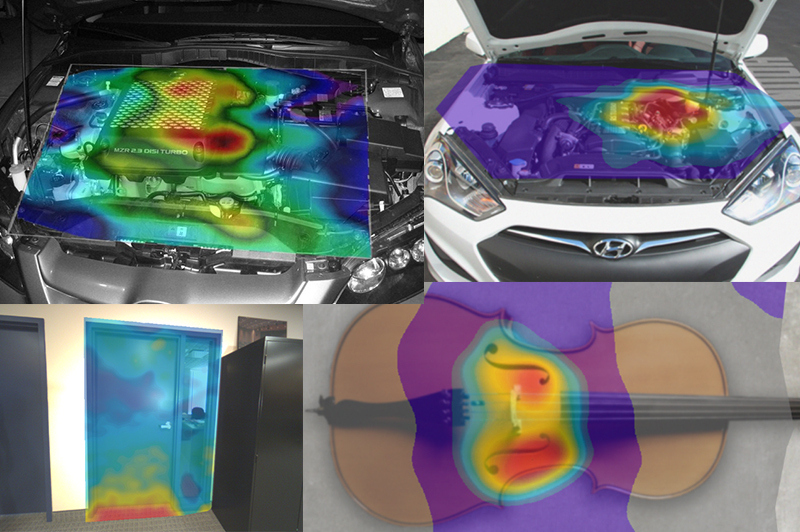 Have Any Questions Concerning Our Acoustical Imagery Services? Our approach to acoustical imagery is unique. Don’t hesitate to contact us to discover how our acoustic consultants can change your life.